Recent reports from the University of Arizona indicate steady and substantial growth for Arizona business and the economy at large within the next 30 years. 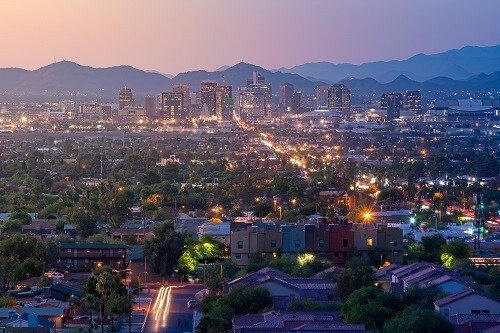 If you live in the state or are considering a real estate investment within the next five years, learn what the Economic and Business Research Center has to say about Arizona’s evolution – particularly in the major metropolitan cities of Phoenix and Tucson. Construction jobs saw an increase of 7% since Q2 2015 as a partial result of new residential construction. Lost jobs amid the mining and logging industry, local and state government sectors and other services. Below average earnings as reflected in 2014 reports provided by the U.S. Bureau of Economic Analysis. Arizona reported an average per worker earning of $52,553 – nearly 8% below the national average. The US economy as a whole will improve over the next three years albeit modestly. GDP growth is expected to rise by half a percent from 2017 through 2018. Exports will remain stagnant (due in part to Brexit) as will nonresidential investments and consumption. Despite the fact that interest rates are on the rise, residential investments will remain strong through the end of 2017. Jobs, population and income although it’s worth noting the growth will not mirror the steady pace it upheld prior to the Great Recession. Arizona will still exceed the national average however. Employment which will reach 4.5 million within the next 30 years or an average growth rate of 1.7% each year. When compared to the expected national rate of .7% each year, Arizona is on track for record breaking employment. The market will rise by as much as 2.3% within the next 10 years then fall a full one percent by the 2036 – 2046 period. Phoenix and Tucson’s population growth will not increase beyond past years’ records though it will extend beyond the national average within the next 30 years. Arizona’s total population will increase by 3.6 million residents overall to a sum of 10.5 million by 2046. On average, the population will grow at a rate over double that of the national rate. While the state’s outlook is overwhelmingly positive, there are still key factors of state and local performance that will be called into question – namely human capital accumulation. The term refers to “the stock of knowledge, habits, social and personality attributes, including creativity, embodied in the ability to perform labor so as to produce economic value.” In short? Human capital accumulation is all the components that determine one’s level of productivity often measured by education. While the population of Arizonans with a bachelor’s degree has steadily increased over the last three quarters of the century, it is still nearly 4% below the rest of the country. Overall, Arizona will grow abundantly over the next 30 years despite a few shortfalls. If you’ve had thoughts about moving to Arizona or buying a luxury home in the Grand Canyon State—particularly in the luxury market—2017 would be an ideal year to do so.